Episode 56: Chipper Bro Bell – Have a Nice Day! Chipper shares how he first became interested in Frisbee in the mid 1970’s in Santa Barbara. It all started while at the weekly Palm Park Art Show in Santa Barbara. He was intrigued by the guys playing in the nearby park. Little did he know that that lovely strip of grass along the ocean would be such a big part of his life. He loved this alternative sport along with the new family he created. As a spectator at the 1979 Rose Bowl, his interest was piqued. He shares his experience playing in the 1981 Santa Cruz tournament, sleeping under the redwoods, eating nuts and berries. It was then that he learned a painful, but invaluable lesson about judging bias. Find out about Chipper’s time at The Flying Disc Ranch near Palm Springs, California…It’s not what you think! Thanks again to those of you that have become Patrons, keep ‘em comin’! 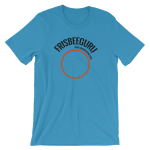 « Trivia: What is the oldest continuous running Frisbee Club?